The fourth annual Napa Valley Restaurant Month is returning in January. Over two-dozen celebrated restaurants will showcase artisanal foods and the creativity of the area’s renowned chefs on special multi-course Restaurant Month menus. Many of Napa Valley’s hotels are offering special lodging packages, making it easier for guests to enjoy the region’s “Cabernet Season”. For a complete list of participating restaurants and to book hotel packages, click here. • Michelin star Chef/Owner Ken Frank of La Toque at the Westin Verasa will offer a Taste of La Toque three-course dinner menu Sunday through Thursday for $50 per person or $82 per person with Napa Valley wine pairings. • The Carneros Inn will offer a $100 dining credit to guests reserving a cottage, suite or home at the resort during January for use at any of the three restaurants on property. Additionally, FARM, the resort’s signature restaurant, will feature three-course prix fixe menu for $49 per person on Thursday nights throughout the month. • The Inn at Randolph will offer guests a complimentary meal for two at the Michelin Bib Gourmand-rated C Casa at Oxbow Public Market when a stay is booked for two or more weekday nights in January. Rates start at $430 per night. • Chef Victor Scargle of Lucy Restaurant & Bar at Bardessono will offer two choices: a signature Lucy Lunch Box for $20 per person with an optional wine pairing for $12 (available Monday through Friday); or a three-course, farm to table dinner for $35 per person with an optional wine pairing for $20 (available Monday through Thursday). 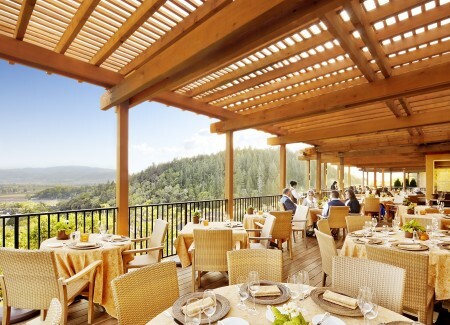 • Michelin star Chef Robert Curry of famed Restaurant at Auberge du Soleil will offer a two-course lunch for $20.14 in honor of the year. Menus will be available Monday through Friday from 11:30 a.m. to 2 p.m. There will also be a weekly wine pairing to complement the meal. • Michelin star Chef/Owner Hiro Sone of Bar Terra will serve a three-course menu using ingredients sourced directly from his local purveyor friends. The menu costs $39 per person with optional Napa Valley wine pairings for $12. • The charming Wydown Hotel is partnering with modern Mexican eatery La Condesa for a “Dine and Stay” package. Located in the heart of St. Helena’s historic district, the restaurant is located walking distance from the hotel. Rates start at $225 per night (including the $75 dinner for two at La Condesa). • Harvest Inn is offering a Max and Relax two-night experience including a welcome bottle of wine, wine tasting at two of St. Helena’s premier wineries and dinner at Tra Vigne Restaurant. To renew after indulging, guests will receive two 60-minute detox massages and a complete two-day cleanse from Philosophie superfood to help return the body to its natural state of unbounded energy, bliss and balance. This package is $859 per night plus tax with a two-night minimum. • At Solbar at Solage, Michelin star Chef Brandon Sharp will feature weekday specials Sunday through Thursday. Offers change daily and include 50 percent off Club Solage member wines, oysters shucked to order, a lounge menu by the bocce courts and Chef’s special fried chicken. • The new 1226 Washington, purveyors of international comfort food, will be serving a seasonal lunch and dinner prix fixe menus with an optional Calistoga wine pairing Wednesday through Saturday throughout January starting at $15 for lunch per person and $25 for dinner per person with optional wine pairings for $24. For more information on Napa Valley Restaurant Month, please visit http://www.visitnapavalley.com.